On simple things that amuse and delight ~ De Vorm had a little plastic toy camera out ~ the single object on one of their tables they were displaying… of course we couldn’t resist picking it up… when a man emerged from behind a panel (while on the phone!) and said “Take it”… hesitating, he encouraged us further… then offered us another! How could we say no? And how could i not wear it? 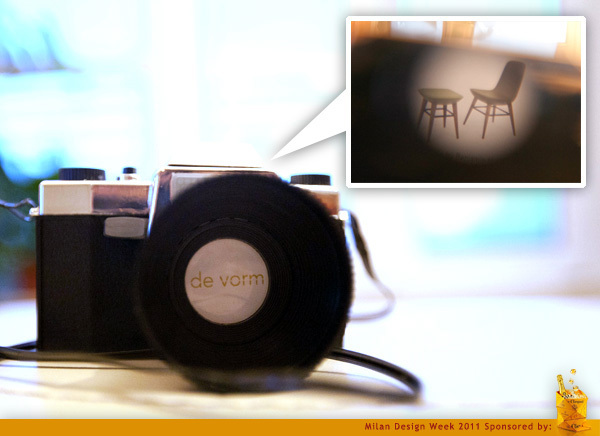 So in Milan Design Week seriousness… i totally wore this silly little toy camera alongside my real one… and inside it? Viewmaster catalog/press kit of sorts! Delightfully fun idea… so simple, so fun, definitely put a smile on my face. The camera is made by Plastiskop - “The Plastiskop models were patented from 1953 in Germany and turned out as the classic souvenir in the 50’s and 60’s, as with the upcoming mass tourism the Plastiscopes became the memory machine of a whole generation. As well in modern times our series for souvenir, animals, fairy tales keep up as a part of the german cultural landscape. Meanwhile the orignal models in their historical moulds are produced in third generation in north bavaria - hand made and almost in the same way as the first plastiscopes were done.” Amazing, right? See pictures of the camera, the press kit materials, and other Plasticopes on the next page! 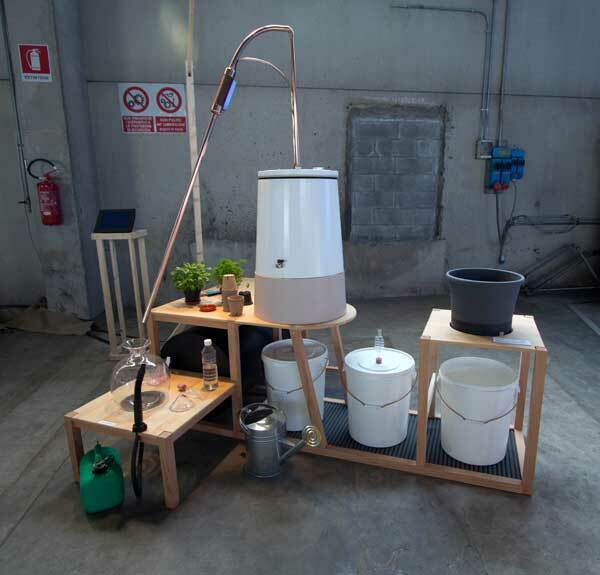 It’s hard not to be drawn in glass bubblers, plants, and large canisters mysteriously hooked up… spotted out in Ventura Lambrate in Milan, this is the Compost Distiller by Lisa Johansson from the Royal College of Art. The unit is no ordinary compost bin. The beautiful system turns plant-based waste into biofuel, soil nutrients and compost. Unlike your typical composter, the unit includes subsections for both fermentation and distillation processes between the bin and garden composter, allowing you to harness more energy and nutrients in the waste before it becomes soil. See more about how this contraption works as well as close ups on the next page! Through a courtyard in Milan… following some mysterious arrows… a few turns, and into a mysterious doorway… we weren’t sure quite what we were in for… then somehow ended up inside Stone Island’s gorgeous room showcasing their Autumn/Winter 2011 collection “The Moon_ The Ultimate Rock of Stone” (Yes, insert giggling fit here) ~ but the room and display were gorgeous, life size vertical displays of models wearing the new collection flipping through… floating perfectly lit panels showing the actual goods… and a gorgeous HUGE moon, so close, yet so far, reflected into the dark space… See more pics of the lovely space on the next page. 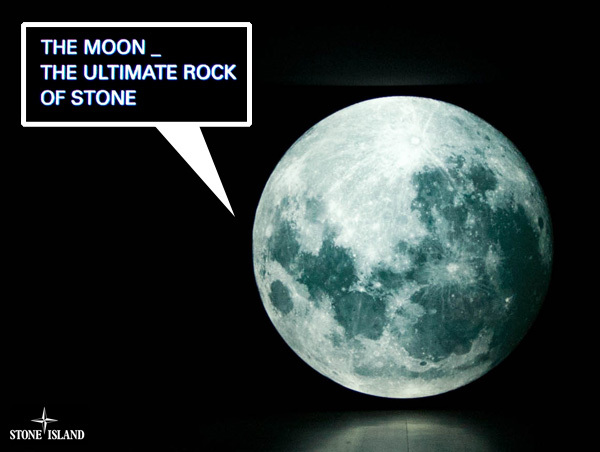 I’d love a magical moon room ~ something so otherworldly, maybe feeling like you’re floating in space?!?!?! More fun Milan discoveries! 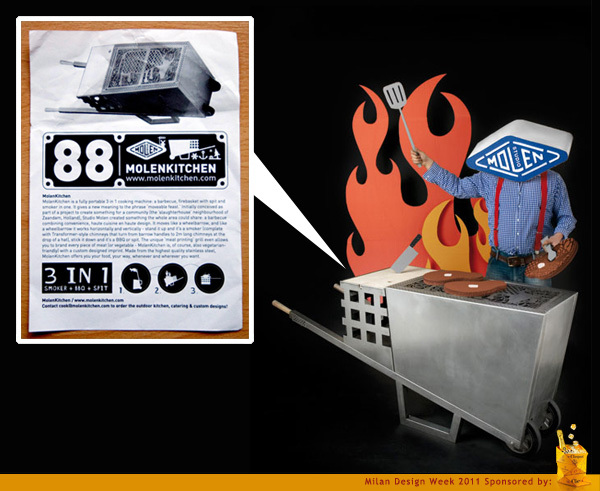 Hard to ignore this fascinating multipurpose MolenKitchen, part barbecue, firebasket with spit, and smoker, all in one. The wheeled unit means you can cook on the go. 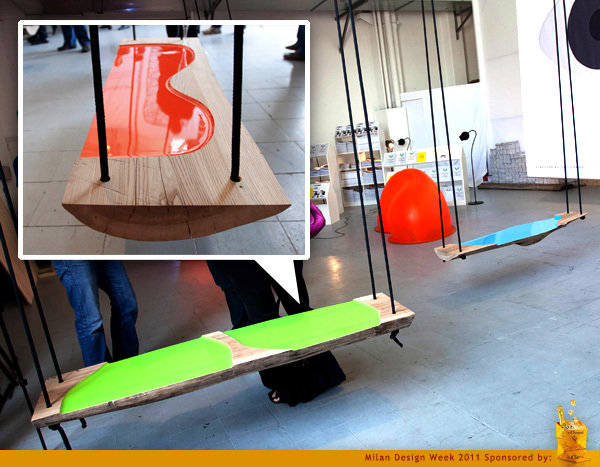 The unit was created as a project for Zaandam, Holland by Studio Molen. The unit moves like a wheelbarrow and works both vertically and horizontally. The barrow handles turn into 2m long chimney when upright, or spits horizontally. It comes with beautiful grilling accessories too, allowing you to brand your creations. This could make for some fun customizations since you can come up with your own designs for both the grilling brands and the grilling surface! Also noteworthy? 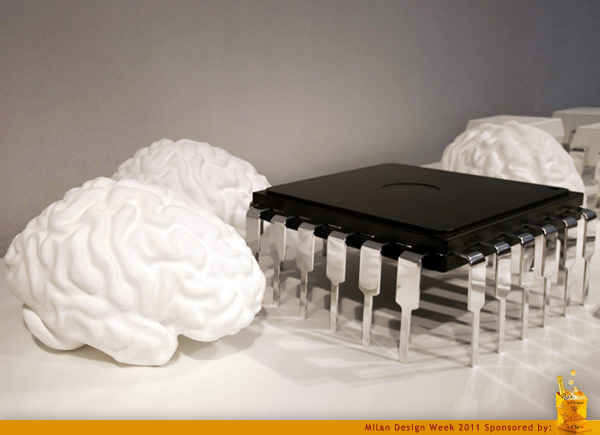 Their awesome graphic design and photoshoot with corrugated cardboard food and more! See more pics of the MolenKitchen in action on the next page! 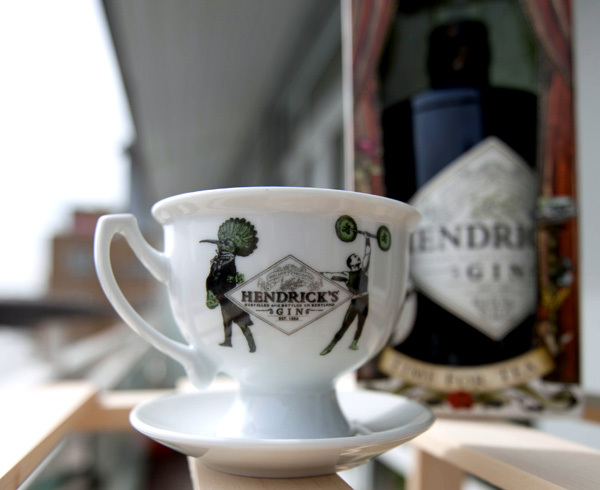 Fun london grocery store discoveries ~ Hendrick’s Gin has a gorgeous, silly tea cup! With packaging of course covered in their playful, cheeky graphics ~ and some tea cup gin recipes on the back! Take a peek at the packaging and tea cup in more detail on the next page! Spotted in Milan, the mesmerizing Flylight, by Lonneke Gordijn and Ralph Nauta (Studio DRIFT) in collaboration with engineers Klaas van der Molen and Luuk van Laake. 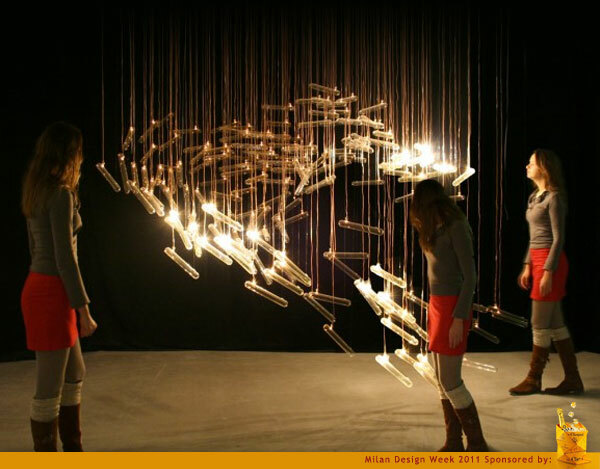 It is a beautiful light installation composed of 160 glass tubes. The tubes light up and respond to the viewer and was inspired by the movements of a flock of birds. 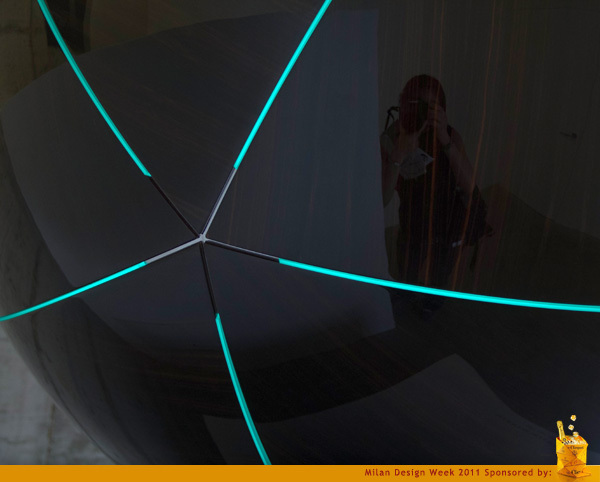 Each light is programmed with digital DNA and responds individually to the presence of viewers. Ultrasonic sensors detect the distance between viewers and installation, causing the ‘flock’ to react differently as visitors come closer or approach the installation in different configurations. To make sense of it fully you have to check out the video and pics on the next page! 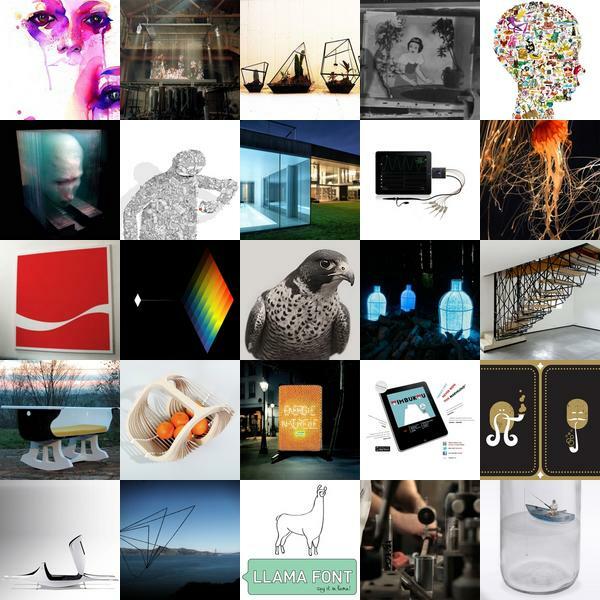 Crazy week at NOTCOT.org with a number of changes and lots of gorgeous posts. We’ve seen a llama font, billboards illuminated by oranges, and much much more. 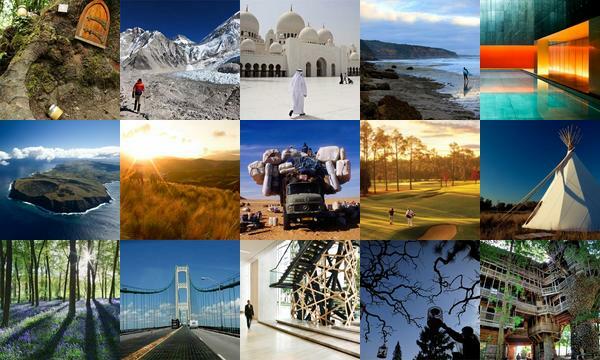 To find out more about each post, click on its individual image. 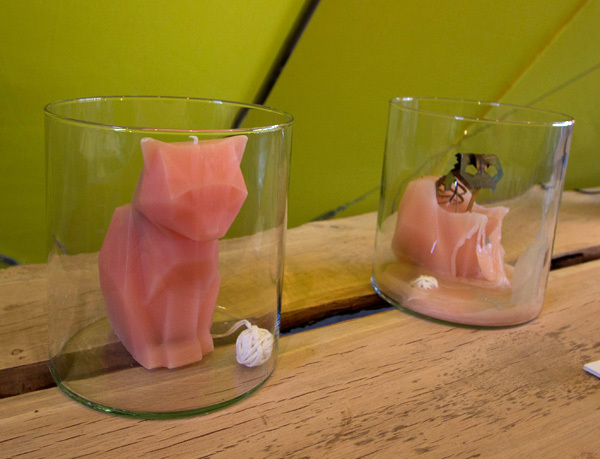 From the Royal College of Art, The Devil’s Pet candle by Thorunn Arnadottir… melt the adorable pink polygon cat to reveal its rather more sinister skeleton beneath… it’s eerie, a bit creepy, and i couldn’t stop staring. Close ups on the next page! 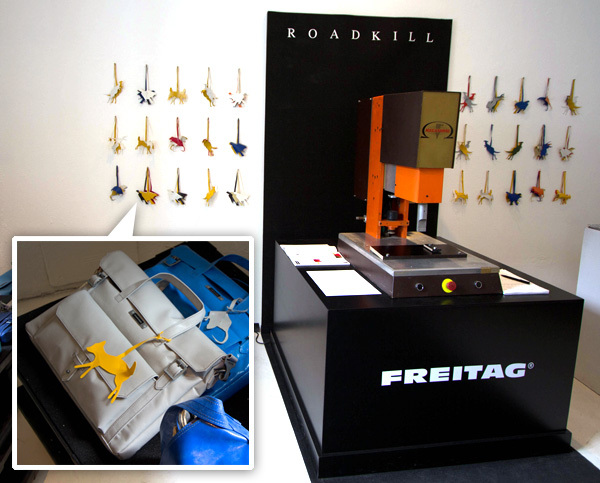 Discovered over at 10 Corso Como, our favorite truck tarp upcyclers, Freitag, have a pop up shop! Featuring a “strictly limited FAKE SNAKE edition in green/grey” for the store, and an installation of Roadkill! Various animals, from rats to birds to foxes to kangaroos, cut in truck tarpaulins are given away for you to put on your bag in solidarity to all the poor creatures that are killed on the roads each day… see more of the description and set up (which include that machine to weld them on to your bag even!) on the next page… i couldn’t help picking up an adorable green kangaroo! 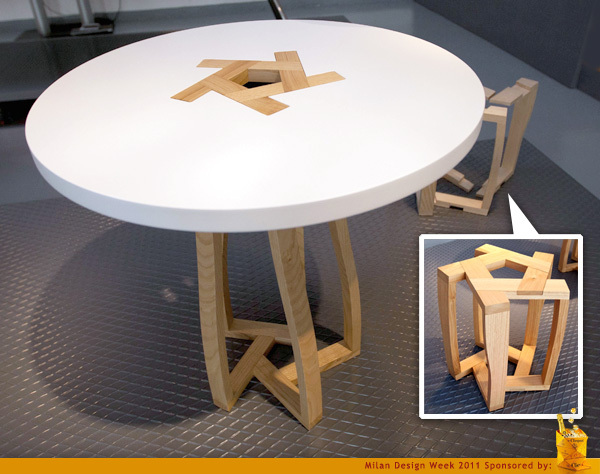 Spotted at the awesome VIA Design: Les Aides a La Creation exhibition were some beautiful, modular pieces ~ like the Pentagon system, which is a series of tables and stools from Itamar Burstein. The pieces are constructed from five identical parts that have the shape of an upside down U (you can kind of peek at this behind the table up there ~ sorry i was distracted and forgot to get a good pic of the pieces taken apart!). These interlock during assembly to form a secure structure and support a table top in the case of the table piece, or for a fun stool in the smaller unit. See more pics on the next page! 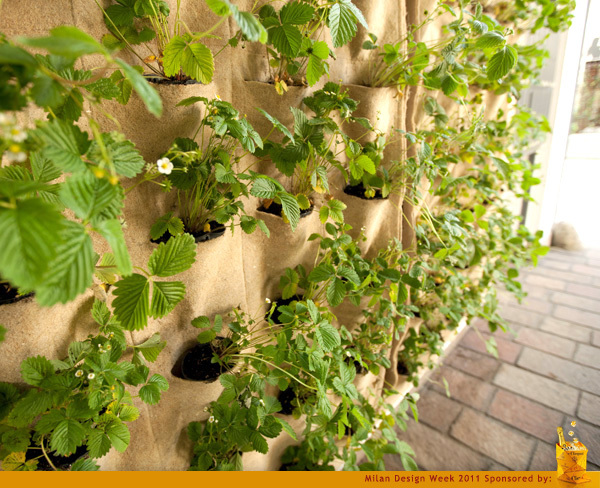 We love living walls (and the many options available!) ~ found a gorgeous entry way of easily DIYable felt pouches housing strawberries and herbs at Ortofabbrica in Zona Tortona today! Gorgeous and simple, you can sew your own pocket panels with two sheets of felt, make grids across them… and slit them and pop your plants in! See the full installation on the next page!